With Easter around the corner the shops are having shelves full of pastel colours, chocolate in all various shapes and sizes and mini eggs. Oh how I mini eggs - the boys have taken a liking to these also, especially the youngest of our crew. Ive seen some beautifully decorated cakes topped with little eggs and of course the classic chocolate nests stuffed with mini eggs. I have such memories as a child making these, and have full intentions in the Easter break whipping up some with M.
I had picked up a couple of bags of Easter Chocolates on my travels and had them stocked up in a jar in th kitchen - taunting me from the side. We were off to visit family and I felt the need to come bearing gifts - and gifts of the baked and chocolate kind are the best in my opinion. 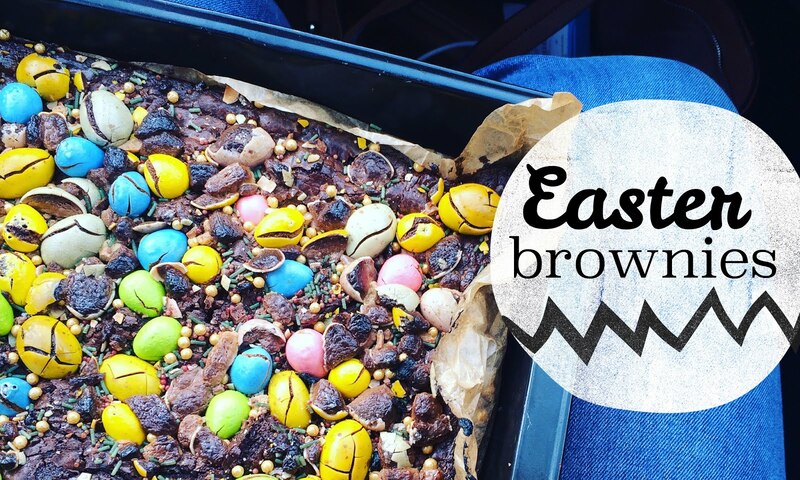 And so born these Easter brownies. I used the Tesco Easy Easter Brownie recipe as my base for the brownie batter. My mother in law is not a fan of too sweet cakes - out I swapped the milk chocolate and added in 200g of dark. 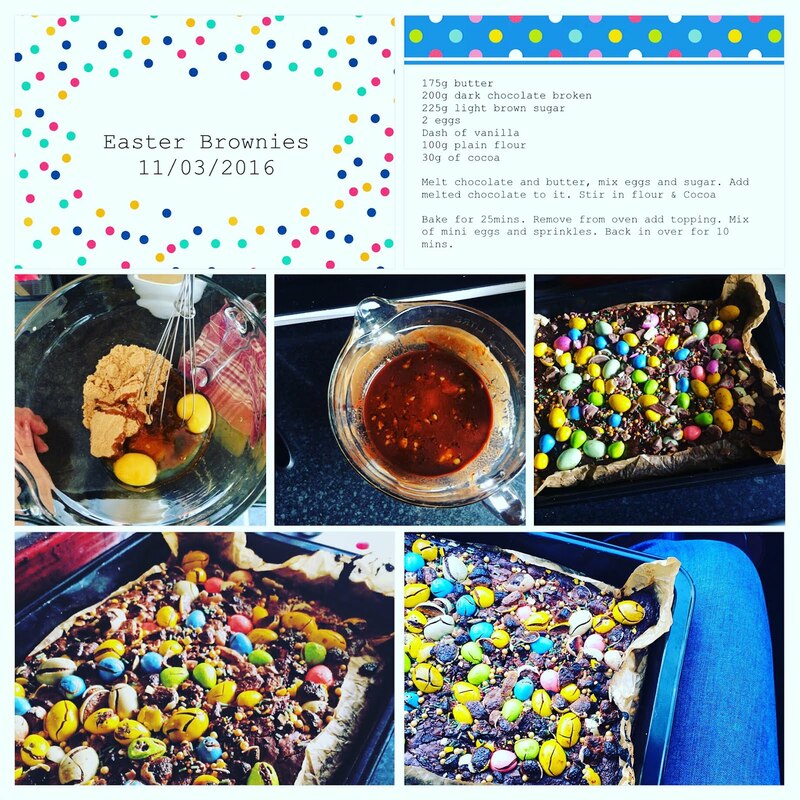 With the added milk chocolate mini egg topping it could do with not being as sweet in the base. In a tweak to the recipe I melted all 200g of the chocolate instead of reserving some to mix in as chunks. To get the topping not too burned, I baked the brownies for about 20-25 minutes on 180c. Remove from the oven and it will still be very molten at this point. On sprinkled the mini eggs, Reeces Peanut butter eggs and various other sprinkles which were in the cupboard left over from various baking en-devours. I gave it a gentle squish down (gentle as it will be hot!) and pop back into the oven to finish baking for about 10-15 minutes. As you can see from my picture mine had started to burn and crack - I misjudged my timings slightly. But who cares... these tasted amazing!! 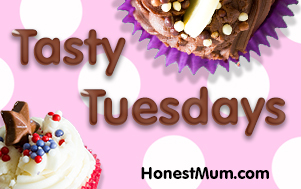 Squishy in the middle with a crunchy topping. That's a good brownie combination - now to start experimenting with some more "topped" brownies. This recipe is a great and a quick mix - no pulling out the big mixer and can be done while balancing a two year old on your hip as he is trying to steal the mini eggs.